We recently were made aware of an important program to help low vision patients have an easier time managing their medications. CVS calls it multi-dose packs. Other pharmacies may offer similar programs. Typically there is no additional cost for this program. The concept is very simple. All the medications that someone takes at the same time of day are packaged together in one packet. For example, morning medications are all in one packet while evening pills would be in another clearly marked packet. The packages may be color coded. 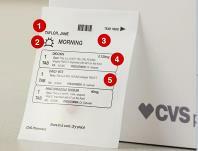 Packets are labeled with the patient name, prescriber, drug name, dosage and descriptions of the pills (i.e. purple capsule, white oval pill). We believe that this program is important for two reasons. First, it is simple to see if someone is not taking their morning or evening medications. Second, and equally important, this program offers low vision patient more control over their lives. They need not be dependent on someone else setting out their pills. Being able to manage medication by themselves, gives people dignity. Thank you to our occupational therapists Katina Lawdis and Susan Gelfman for bringing this program to our attention.